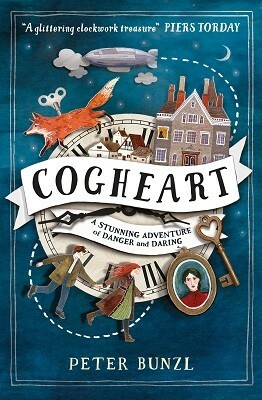 I am delighted to invite Peter Bunzl to the blog to talk about his novel Cogheart, which was awarded the title of Waterstone’s Children’s Book of the Month for August. Thank you so much to Peter for taking the time to chat about his wonderful book! “Lily’s life is in mortal peril. Her father is missing and now silver-eyed men stalk her through the shadows. What could they want from her? What was the spark of the idea for Cogheart? The inspiration for Cogheart came from reading about the inventors and clockmakers of the 18th and 19th Century, who were the engineering geniuses behind the first automata and androids. Books like LIVING DOLLS by Gaby Wood or THE TURK by Tom Standage – which are both popular histories of clockwork robots and their inventors. It was thinking about those inventors and their desire to create mechanical artificial life – or even just an illusion of that life –which chimed with me as a writer and an animator. It brought up intriguing questions, such as – What makes us human? And could those quality ever exist in a machine? The book is set in an alternate version of Victorian England complete with mechanicals and airships- it’s being described as steampunk. How did this come together? Aside from the automaton angle, I really wanted to write an epic, children’s story full of steam-machines, airships and adventure – and the world in which I felt I could best combine those two ideas was a Victorian steampunk one, so that became the setting for Cogheart. The details of the world come together as you write, it’s an alchemical process with the world and its rules growing as you draft the book, depending on the necessities of the story. How long did it take you to write Cogheart? It took me around three years to write Cogheart. I would take sections to show the different writers groups I was in, and, one day when I finished the second or third draft, they said to me: “just send it”. I did and it got some rejections, so then I paid for an editorial critique and worked on the story a bit more for six months. After that I sent it out again and, within about four months, I had an agent interested, who truly loved it and wanted to represent me. What would you say were the biggest challenges in the writing and/or publishing process? There are so many different challenges to the writing and publishing process, and I think it entirely depends on where you’re at. To finish the draft of a book and get someone to read it is a big achievement. Then there’s editing – getting it good enough to send to agents. And if they sell your book, you work with an editor at the publishing house and take onboard their suggestions. Then there’s publicity… The process goes on and on, and you learn what’s required of you at each stage. But, in the beginning, be prepared to work HARD on the manuscript to get it as good as it can be. After that all you need is a little bit of luck! Cogheart was Waterstone’s Children’s Book of the Month in August – congratulations! How did that feel? Absolutely stupendous! It was a dream start for Cogheart. The booksellers were amazing and got behind the book with all sorts of beautiful windows and point of sale displays. I went round so many shops and met some of them in person, and they were so lovely and enthusiastic about the book, and told me how much they enjoyed it, and how they’d been handselling it – which is what you want! As a writer you spend so much time working towards publication, and you dream of your book launching with a BIG BANG! Getting Waterstones Children’s Book of the Month really does help that happen. 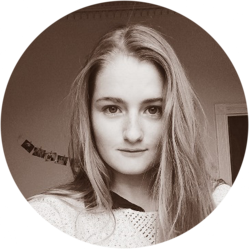 Lily is brave, passionate and self-empowered in an era that restricted girls and women immensely. Did you deliberately create her to be this way? Do you agree that it is important to give young boys and girls powerful female characters like Lily? Yes, I did deliberately create her that way. It took a long time to feel like I got her character and who she was, for the very reason you mention – I wanted her to be a modern, brave, empowered heroine, but she also had to have a bit of Victorian-ness about her, and it was hard for me to work out that balance. I think it’s so important young girls and boys have powerful female characters in their stories. I love the quiet, brave characters in Diana Wynne Jones’s and Eva Ibbotson’s books, and more rambunctious wild heroines – like Lyra in Philip Pullman’s His Dark Materials, or Dido Twyte in Joan Aiken’s books. Myself and many other readers of Cogheart have loved Robert. He is quiet, thoughtful and incredibly loving and loyal. Where did he come from? Lily’s personality is a little bit based on my sister when she was younger, but Robert is most definitely more like me when I was a kid. I was quite shy and a bit geeky – about animation, not clocks, but I did used to make things too, art projects. Robert is clever with his hands and thoughtfully brave. Lily is head-clever and also a little more impulsive. Anyway, because of all that, Robert was much easier to write as I knew exactly how he would react in any given situation. Roach and Mould are a terrible pair – what makes a good villain? A good villain needs to make the hero’s life hell at every turn, and always be one step ahead. They can be scary or gruesome, larger-than-life or quite subtle in their characterisation. But, it’s important to remember that villains always have their own reasons and motivation for doing things. You need to see their side of the story as a writer and believe in it, so no matter how bad they are, there’s always a fragment of logic and truth behind their motivation that makes them credible. Did you set out to write a children’s book? Have you always written for young people? I set out to write a book for Young Adults, but along the way it turned into a children’s book, because the plot and story was much more suited to that age group. As soon as I realized that was the way it was going to go I wrote a little Post-it for myself with the words: MARVEL, MAGIC and HUMOUR on it. So I knew the things I needed to add more of in the edits. Cogheart is adventurous, full of daring and plot twists. How did you plot it? Are you a “planner” or a “pantser”? I am both a plotter and a pantser. Before I start writing I write a synopsis of 5-10 pages, which includes as much of the plot as I have at that moment. There will be holes, but I try not to worry about them. Then I go ahead and write the book from start to finish. If I get stuck writing in order I’ll skip ahead to a bit I’m sure of, later I go back and fill in the blanks. I loved the technical detail you included about Anna’s airship- gondolas and barometers and starboards. It made the setting so authentic and real! How much research did you have to do for Cogheart? I researched quite a lot into airships and automata, but I’m not particularly technically minded, that sort of detail just washes over me. It’s steampunk anyway, and that doesn’t have to be authentically accurate, so I felt free to make up bits and pieces around the basics of airships and inventions. What are some of your favourite books and have they influenced your writing in any way? As a young reader I adored the quirky British fantasy of Diana Wynne Jones, Roald Dahl and Joan Aiken; I was forever popping into the bookshop to see when the next Terry Pratchett was coming out. More recently I loved Philip Pullman’s His Dark Materials series and his Sally Lockhart books, plus I enjoy a bit of Dickens, and greatly admire Mervyn Peake’s incredible Gormenghast stories. They all influenced me in countless ways – some for plotting, others for character or worldbuilding; some for poetic language, strange names, humour, whatever. When a stunning sentence jumps out at me from a book I underline it so I can refer to it later when I need writing inspiration. How involved have you been in promoting the book? Before Cogheart came out I visited five Chatterbooks Groups who’d won proof copies iof the book, I talked to them about writing and being an author. Since the book’s come out, I’ve done more events – school visits and trips to bookshops and libraries. I’ve met so many awesome kids and librarians, on my travels and got lots of fantastic feedback on the book from those who’ve had a chance to read it. What would be your favourite aspect of a steampunk Victorian England if you could join Lily and Robert in their world? I would love to fly in an airship. I think it would be the most astonishing way to travel. When I was researching the book I listened to an audio interview with a English Woman who had flown on the Graff Zeppelin when she was a girl, and she described the view from the lounge windows as they flew over different places, how she was shown the interior of the balloon and even the flight deck, it sounded magical. I hope one day they bring back that mode of transport and we can experience it again! Do you have any advice for new writers of children’s fiction? Write every day. Write what you love, not what you think the market is looking for. Try to finish your drafts. Edit them as many times as you can, until they’re as good as they can be, or until you can’t bear it any longer! Then, if you want people to read what you write, send it out… to competitions, agents, publishers – whoever! If you get good feedback, or editing suggestions, take them on board. And while you’re waiting, write something new. You’re working on a sequel to Cogheart called Moonlocket. Can you tell us a bit about that? Thank you so much, Peter. You can find out more about Peter on his website and purchase Cogheart from Waterstones here. Happy reading!